I love collecting old photographs. 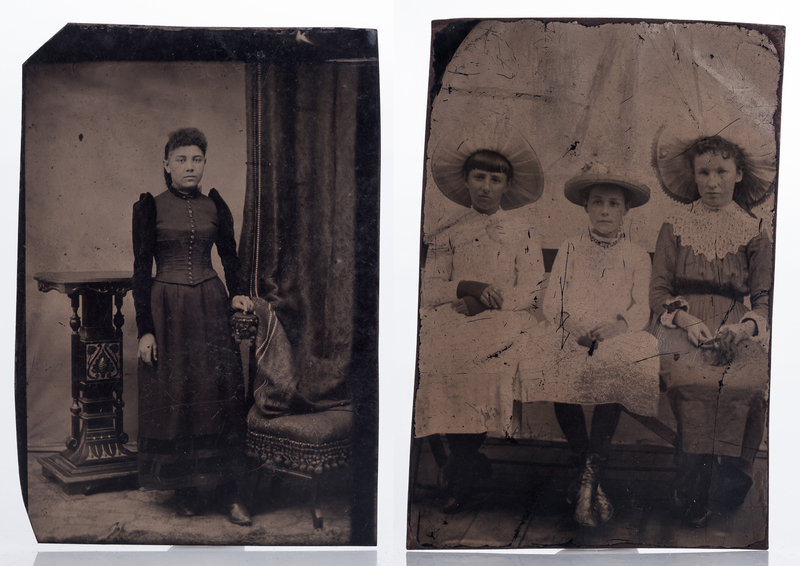 I have recently been given a shoebox full of tintypes and glass plates (ambrotype). 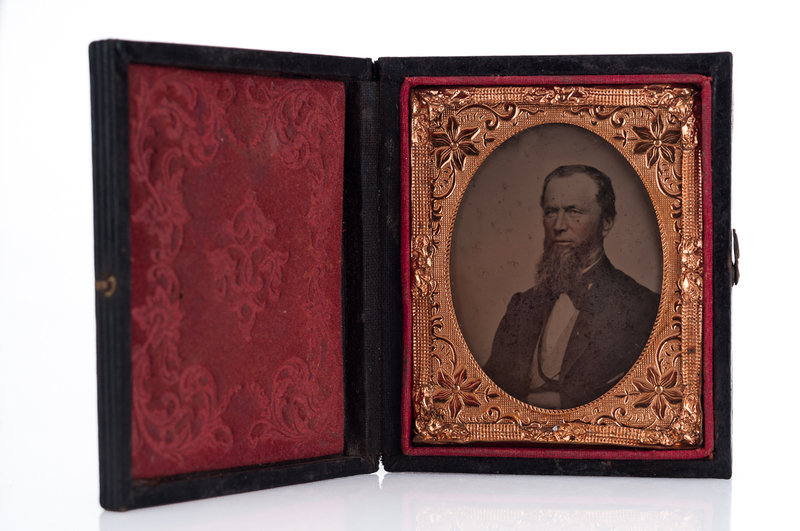 The image above is a copper framed ambrotype in a small wooden album that’s lined with velvet. This album is in very good condition. Click on any image to enlarge. I’m not giving a history lesson, so if you want to learn the history of photography, there is much online about the topic. 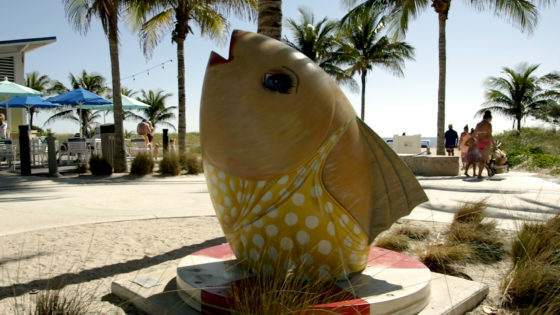 Here is a quick LINK for that information. 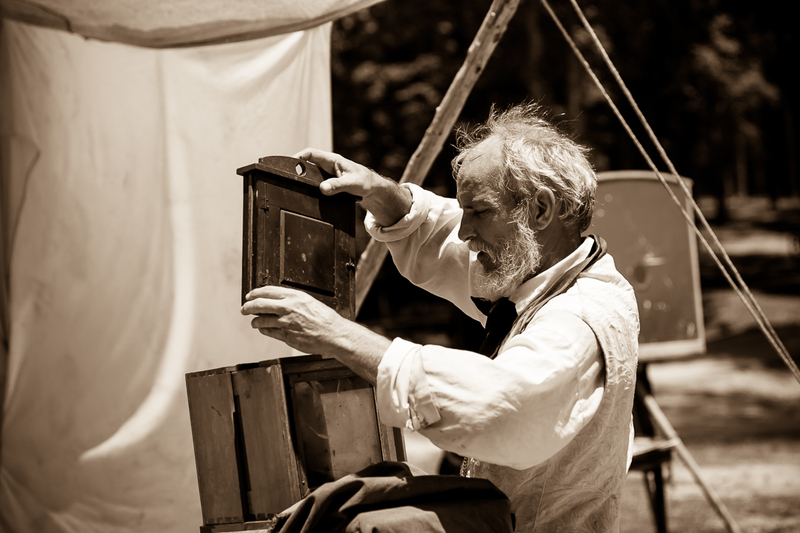 I will give a brief rundown of the process of taking a photograph with some photos that I took at a Civil War reenactment. 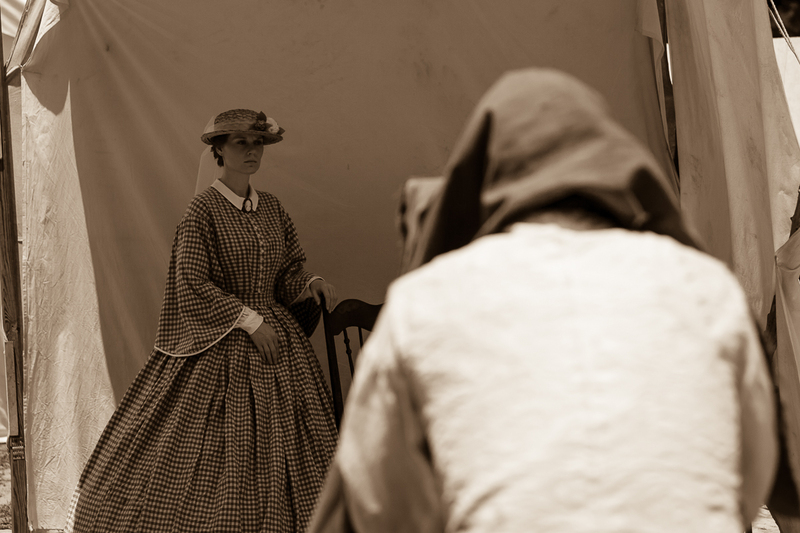 Yes, I enjoy going to living history places and reenactments. 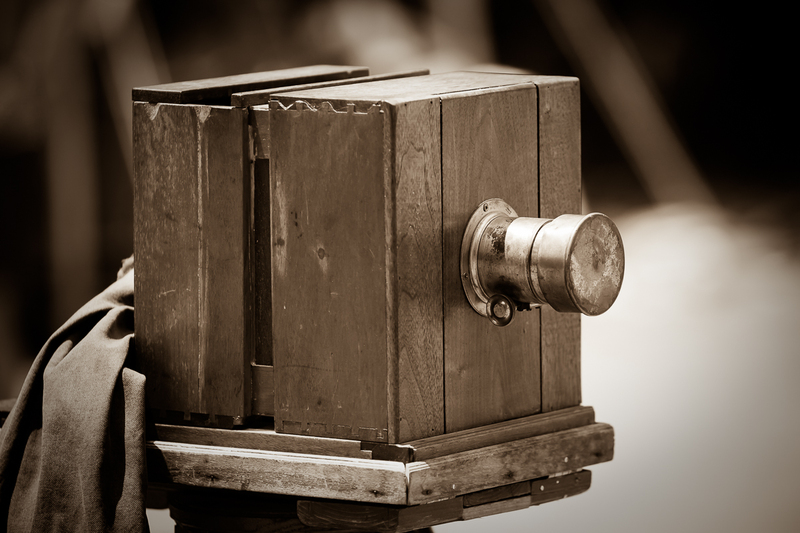 This is one of the types of cameras used around the 1860’s. It’s just a plain box with a lens made of glass and brass. There is a slit on the top to insert the media. The media would would be a coated piece of iron, copper or glass inside a light, tight tray (where light could not enter). The photographer would then slide the tray in the slot and remove a dark slide (part of the tray), which would then ready the media to be exposed with the light. Before the photographer inserted the media, they would need to focus the camera. 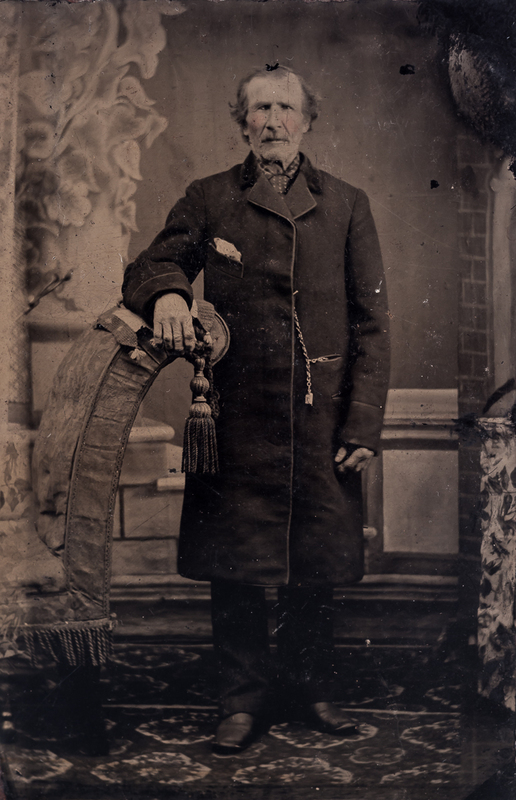 As you see in the photo above, the cloth is in the rear. 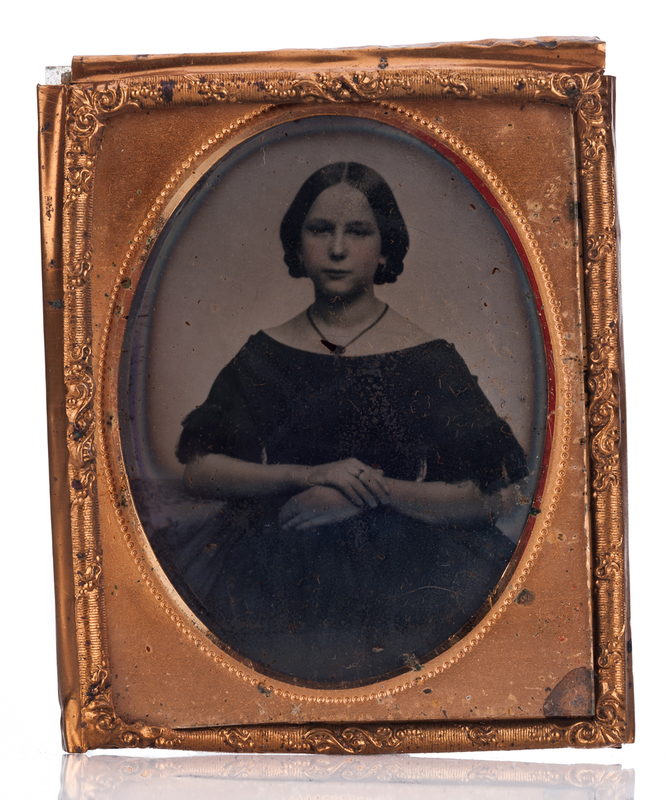 The photographer would put that cloth over their head and look through a ground glass (a pane of glass ground to produce a flat, but rough matte-type finish). To use the ground glass, the photographer inserted the glass in the back of the camera, and then opened the lens to its widest aperture. This projected the scene on the ground glass upside down. The photographer focused and composed using this projected image. In order to see the image better, the dark cloth was used to block out light. To focus the image, the camera is in two parts. The rear part can slide forwards or backwards. Once the focus is set, the photographer inserted the media and then removed the lens cap. By removing the lens cap, this exposed the media. 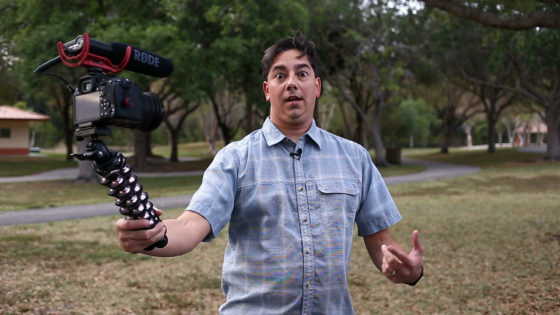 The exposure could be from seconds to minutes depending on the available light. After the photographer replaced the lens cap, they would replace the dark slide, then remove the media tray. 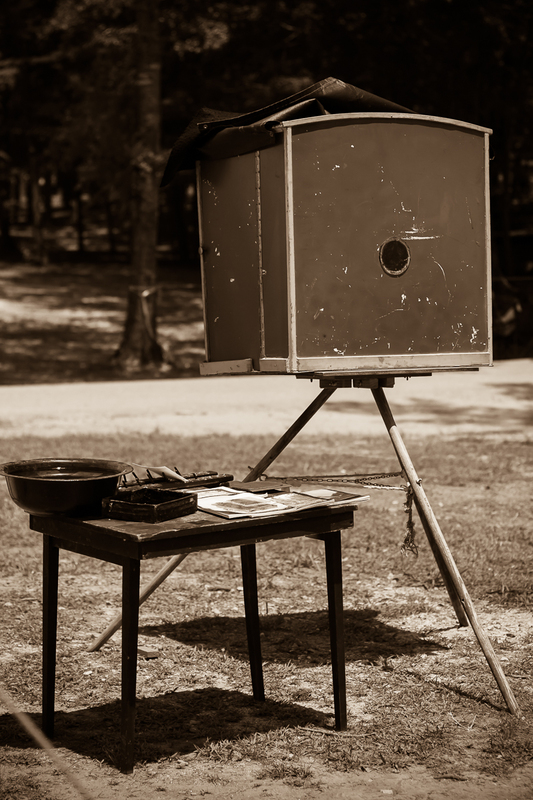 As you can see below, most photographers back in the day used canvas tents as a studio. The two photos above show a photographer focusing under the cloth and then loading the media tray. The image to the right is the developing box. The developing box is dark inside, it houses the chemicals, and it has a small red or amber glass pane to let in a small amount of light to help in coating and processing the media. Since the media is sensitive only to blue, or to blue and green light, a red or amber colored light can be safely used without exposing the media. For the tintypes, the iron was coated and then placed in the media tray wet. The iron was then exposed to the light with the camera, while the media was still wet. The photographer would take the media tray after exposing the media and stick his head in the box under another cloth. Then the proper chemicals, mostly made up of cadmium bromide, cadmium iodide and silver nitrate, were used to develop the photo. Then, the photo was put in a wash and rinsed. 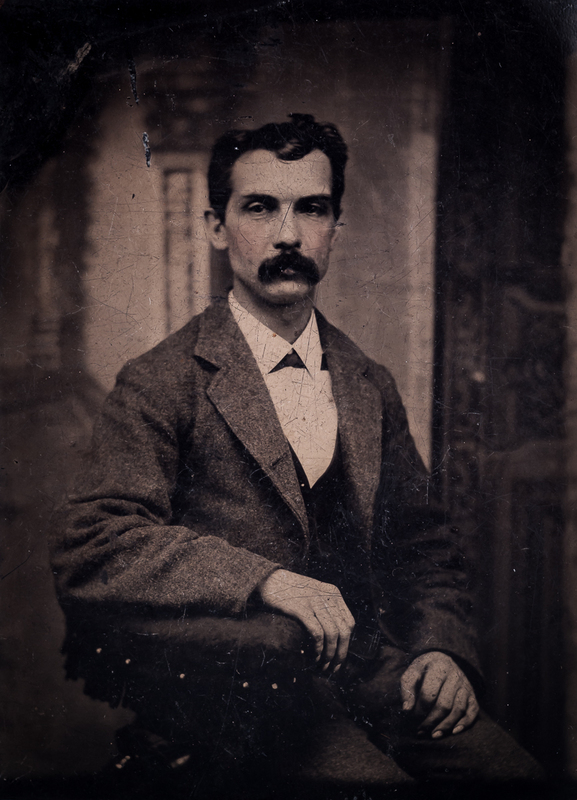 The photographer would travel by wagon with his equipment and set up his mobile studio doing portraits while working in towns, carnivals, and fairs. 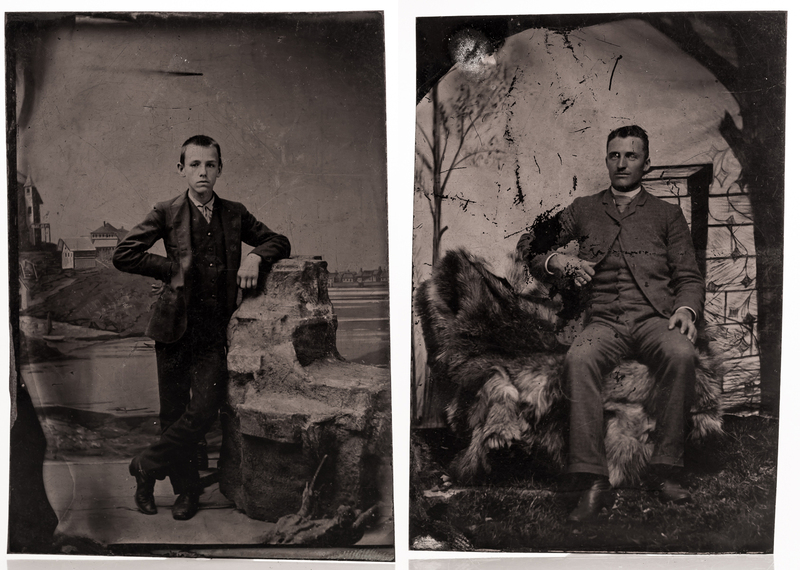 The photos where commonly called tintypes, because the metal used was tinned iron, though none of which were made of tin. Cheap things in the nineteenth century were often made of tinned iron that was coated with a shiny black finish applied to the surface to prevent rusting. 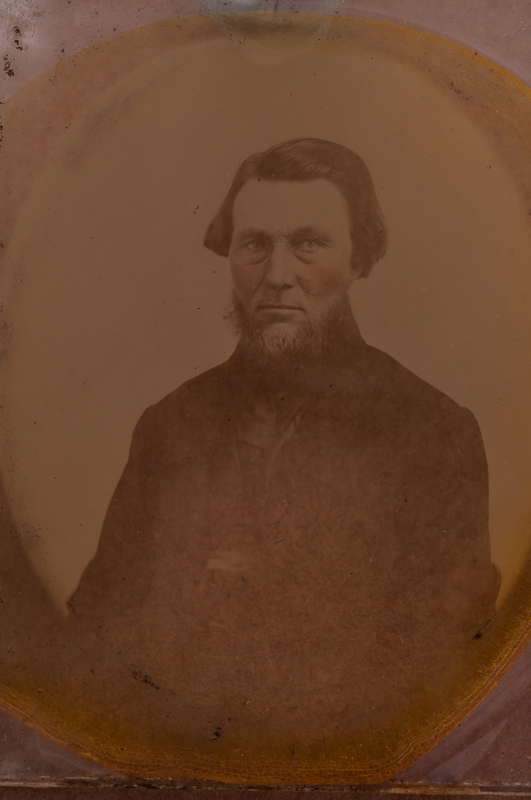 I tried to reproduce my tintypes as closely as possible. The glass plates were difficult to photograph because of glare. I used a Nikon camera with a Zeiss 50mm f/2 macro lens. The light was from a Profoto 2400D pack with 3 heads. 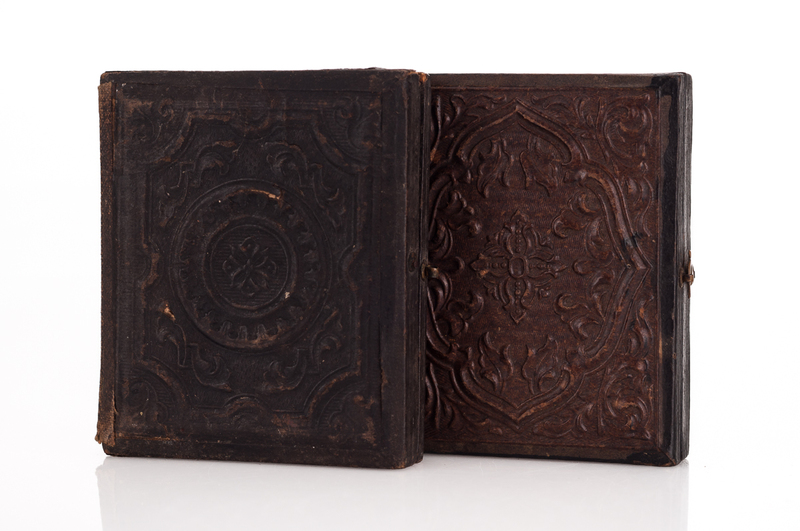 The two photos above show the outside of the wooden albums. 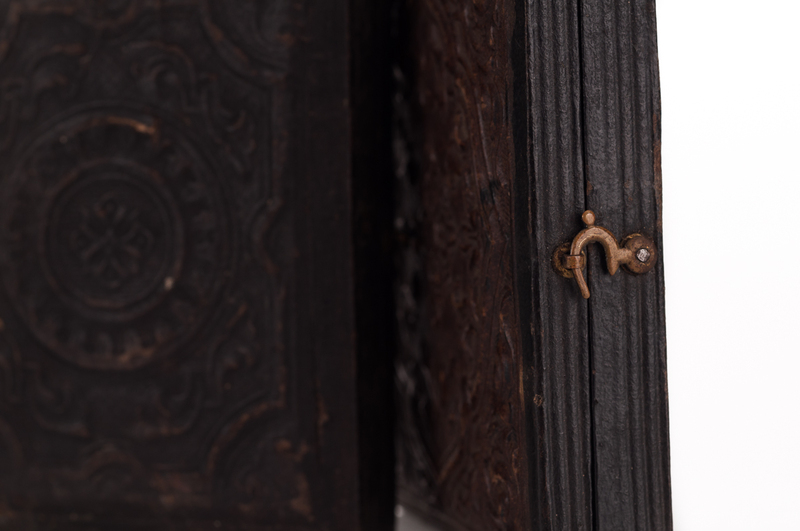 They are decorated with leather reliefs with a little latch on the side. You open it up like a book. Both sides are bound together with a cloth binding. 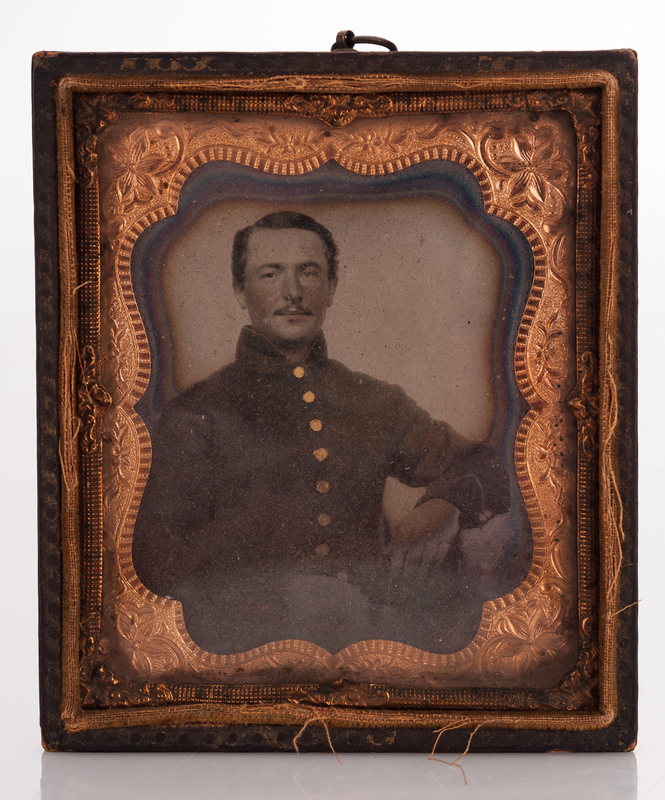 The photo above is a glass plate (ambrotype) framed with copper. You can see the black and white image had a little bit of touch-up work done (primitive Photoshop back then). The checks have been hand painted to simulate a little bit of rouge. The image below is one of my favorites from the shoebox. As you can see, even the gentlemen had a little rouge going on in the photos. The photo above is another favorite. The left side is very close to the original, the right side is my cropping and converting to black and white. I wanted to see how it would look. The image below shows a young boy and an adult. There were a couple of photos of young boys with the same background as the one on the left. With all my years as a school photographer, I assumed this young boy was posed for his school portrait. The gentleman on the right looks like he might be sitting on a grizzly bear pelt. The photo above is another one of my favorites from the shoe box. I love the hand painted background, the carpet, the chase lounge prop, and of course, the rouge. After going through all the photos, I noticed that they were all prominent-type, East coast people. 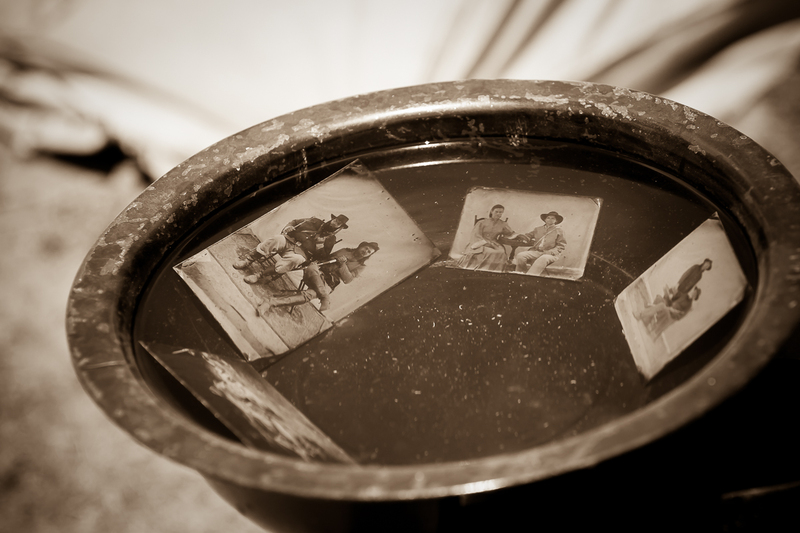 Most of the old tintypes that are highly collected are of solders, cowboys, or historic events. I really wanted to find a soldier in this shoe box. The image below shows the only soldier-type uniform dress from the collection. This is a glass plate, and if you notice, the buttons have been hand painted and rouge applied. The image below has been cropped just a little. I would love to find one of those old posing stools. I have seen this type of stool in a couple of the other photos from the collection. 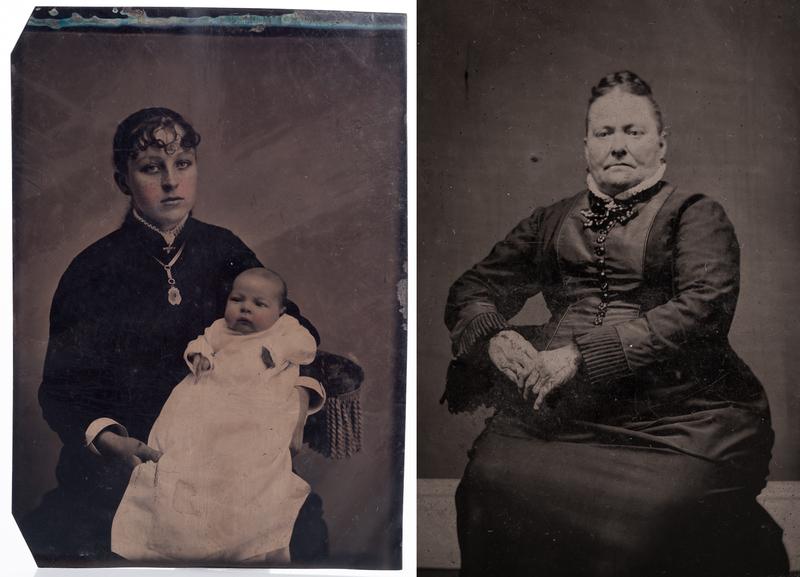 The next two images show a glass plate. I had to photograph the plate on a piece of cardboard to get the latent image to show through. Glass plates where put in frames or the back was painted. This was done so you could actually see the image on the glass. I was amazed at the detail in the face of this man. As I am writing this, I realized that this is not just a plate for a frame, but is also used as a negative. 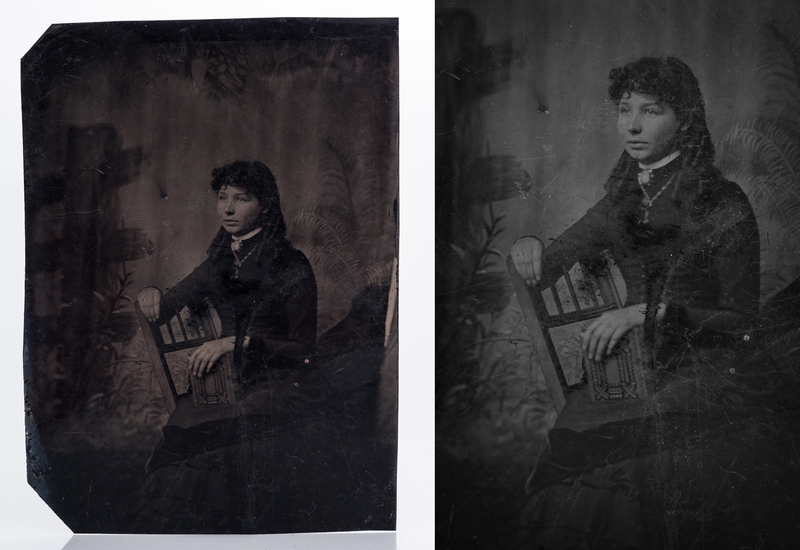 Below, the image on the left, is the tintype exposed from the glass plate above. 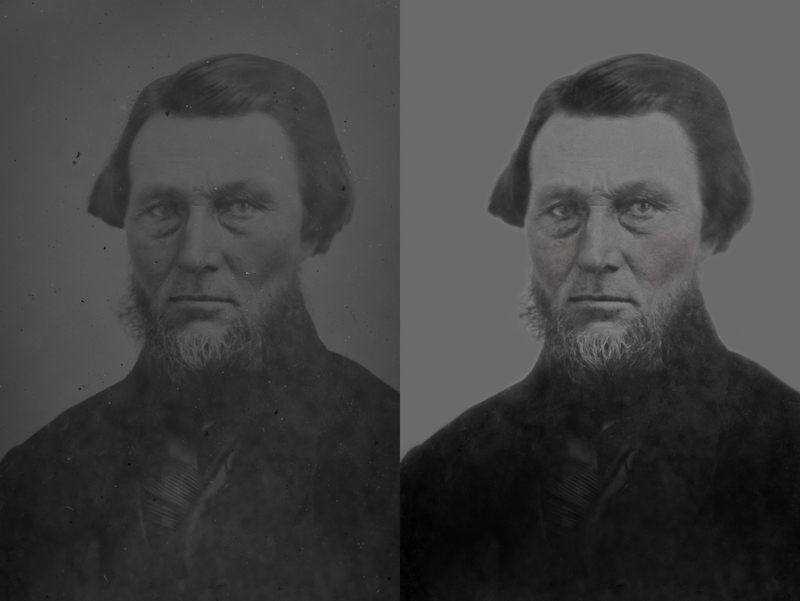 The image on the right is my restoration. 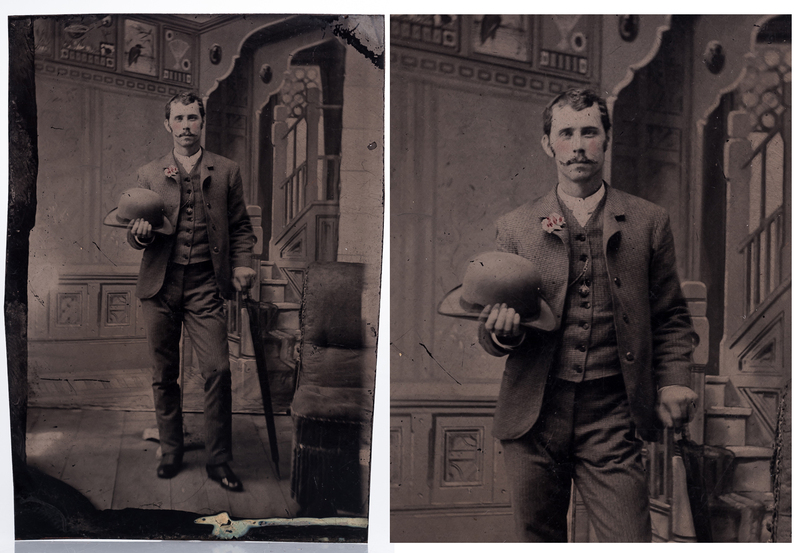 I am not that great at photo restoration, but I really wanted to work on one of the images. Yes, I put rouge on his cheeks. If you look close enough on the glass plate above, you can see that the plate has been hand painted for rouge. 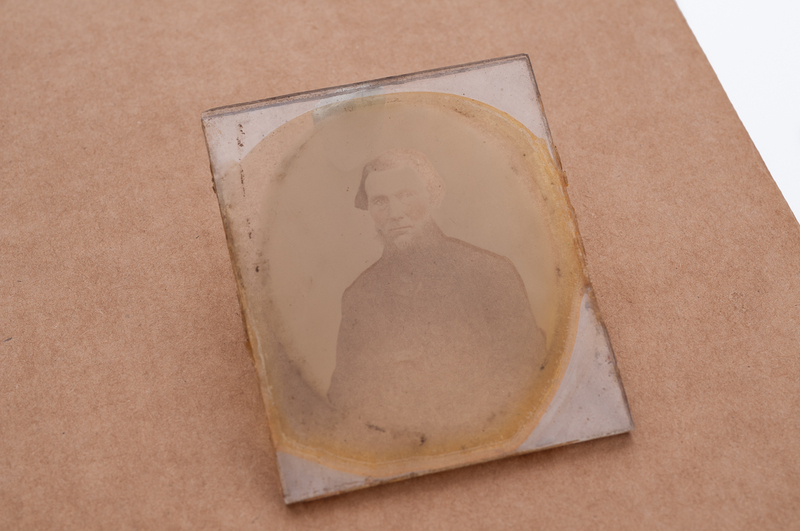 The image above is another glass plate. I would say that this one is a little newer than the rest. The coating is spread very evenly across the plate and the back has been covered with a very dark red paint, which helps in viewing the image. I had to use a light from the back to illuminate this one. Just look at all that detail in this photo from just a simple wooden box with a small one piece glass lens. 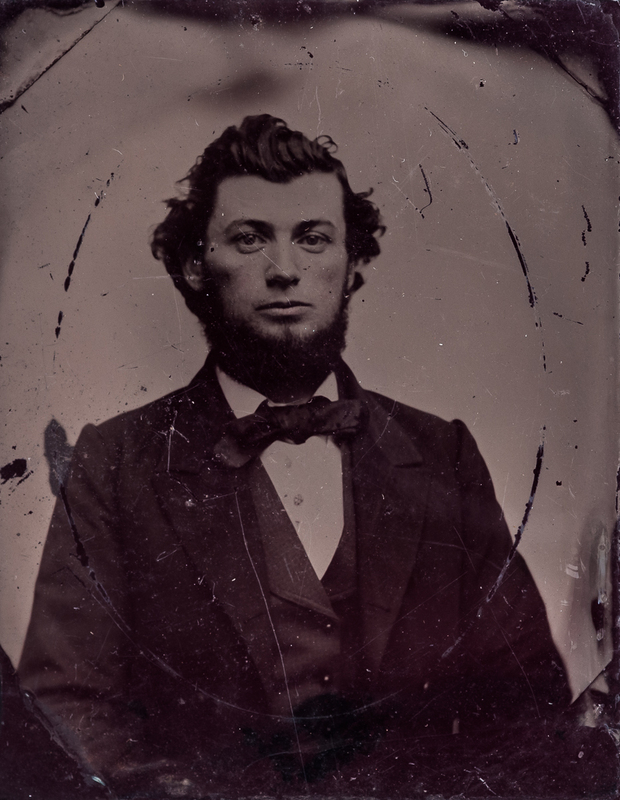 I hope you have enjoyed seeing some of my recently acquired tintypes and glass plates. If you have any old photos or cameras that you want to get rid of, just let me know. 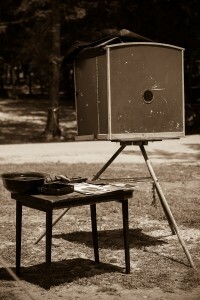 If you have any questions about my tintypes or my blog, don’t hesitate to ask.